According to a recent report from United Press International, The U.S. Supreme Court, with it’s 5-4 conservative majority, may be poised to make major changes to the national healthcare reform law when it rules next year on a challenge brought before it by 26 sates. Such a move by the Court could also deal an important blow to President Obama’s re-election chances. 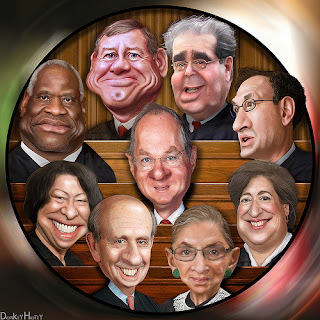 The significance of the case and its possible political ramifications have caused scrutiny of the justices themselves. For instance, some Republicans are demanding that Justice Elena Kagan recuse herself from the case because, before she was named to the Court, she served as the Obama administration's top courtroom lawyer when the Patient Protection and Affordable Care Act was brought before Congress. Justice Kagan is also reported to have emailed a friend and former colleague, Harvard Law professor Larry Tribe, expressing her excitement over the bill’s passage. Not just Republicans are concerned about potentially tainted justices, some Democrats are demanding Justice Clarence Thomas withdraw from the case because of his wife’s links to organizations dedicated to overturning the healthcare law. Democrats have also seized on news that on the same day the Court decided to accept the challenge, Thomas and Justice Antonin Scalia were attending a dinner sponsored by the law firm that will be arguing the case before the Court, the Los Angeles Times reported. Those same experts also agreed that Kagan cheering on passage of the health care law did not mean much and that justices are permitted to have and to express personal views on issues before the Court. Even though some conservatives have seized on the fact that Kagan’s email to Tribe contained two exclamation points — “I hear they have the votes, Larry! !” — her excitement over the bill’s passage does not rise to the level of conflict and would thus not require her to recuse herself from the case. Kagan, however, was more than just excited about the bill. She was also the head of the office that would have to defend the law in the case of a constitutional challenge. It is this position and her role, if any, in preparing the Obama administration’s defense of the law, that may lead to increased pressure to distance herself from the case. The rule of thumb is that a judge should not participate in a case if he or she was involved in it as a government attorney. Kagan stated in her Senate confirmation hearing that she was not involved in preparing a potential defense of the law. But some internal emails that have been released indicate that she was at least asked about the question, even though she was too cagey to answer the questions over email and suggested a phone conversation instead. It’s the appearance of a conflict here that prompts many to say the Justice should recuse herself. However, as one former White House Counsel member put it, in the end “justices recuse when they want to recuse, and there’s nothing we can do about it.” Moreover, if Kagan were going to recuse herself, it would almost certainly have been noted in the order issued by the Court upon accepting the case. Despite the calls from both sides none of the justices have given any indication that they are willing to step down before the challenge is heard for five and a half hours in March 2012.